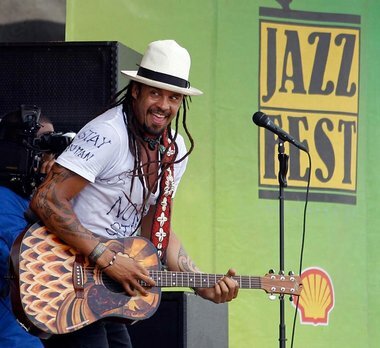 Michael Franti belongs to the leaping, prancing, uber-aerobic school of New Orleans Jazz Fest performance. The Oakland-born, 45-year-old artist, who brought his Spearhead band to the Gentilly Stage on Sunday afternoon, exemplifies the law of physics that states a body in motion tends to stay in motion. From pretty much the moment he launched his set, Franti seized every opportunity to do anything except stand still. Not content with the nominal floor space afforded him, more than once he waded into the audience, climbing the barricades, slapping high-fives and bringing like-inspired souls up on stage to shake and shimmy beside him. Stylistically, Franti serves up a tightly constructed blend of reggae, hip-hop and contemporary pop idioms. In other hands and from another's throat, that kind of overlap could clash, or at least sound awkward. But Franti's brand of percussive, rapid-fire delivery defuses almost any objections. He has plenty of fun, and dares you not to. Many of his songs speak of an all-encompassing, forgive-thy-neighbor world view. "Life's too short to make one decision," he declared. "Music's too large for just one station. Love's too big for just one nation, and God's too big for just one religion." Not that he's all Big Statements. "Shake it, shake it, shake it, shake it!" Franti cried, and yes, his listeners shook it, hard and fast. "Bring the party to the street!" Lost affections were part of his expressive imperative. "I was walking like a lonely man," he confessed in one song. "The only thing missing was you." Franti summed it up this way: "There is life in this love, love in this life." Don't chew on that too long, though. Better to enjoy this instant in time, shaking it all the while.